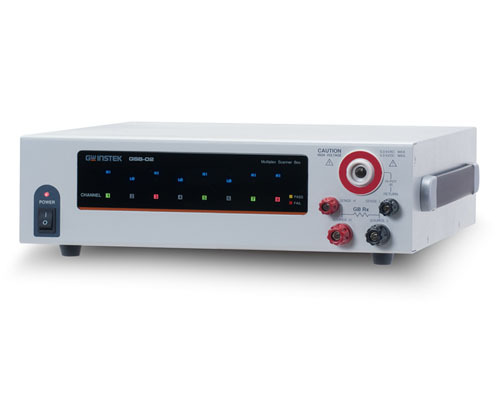 An electric potential mode for each channel – HI (voltage applied), LO (return) and X (open mode) can be set either by the front panel operation or through commands by the USB/RS-232C of GPT-9800/9900/9900A. The multiplex scanner permits specified setting – AC/DC withstanding or insulation resistance or ground bond tests on assigned one of the eight test channel. For example, you can set CH1 ~ CH3 to HI (high voltage) and CH4 to LO. GSB-01 : Multiplex Scanner Box – 8CH H.V. GSB-02 : Multiplex Scanner Box – 6CH H.V./ 2CH G.B.